Software-as-a-Service (SaaS) is fast becoming the service model of choice. Thanks in part to game changing players like Salesforce, Slack and Quickbooks that brought greater efficiency to everyday business workflows, organizations everywhere have discovered the inherent value of SaaS to their bottom lines. Not only are SaaS solutions relatively easy to deploy, they also enable end users across business units to accomplish tasks with more ease, speed and agility. On-premises software development and delivery may be declining, but cloud-based SaaS will only continue to grow as more organizations realize the cost savings and business enablement it provides, along with the quality of service and access their end users demand. While the expansion of cloud services presents an enormous opportunity for SaaS providers, it also brings new challenges. As SaaS providers scale, they will need to find data center partners that can help them manage the increasingly common hybrid IT and evolving multi-cloud infrastructures of today. 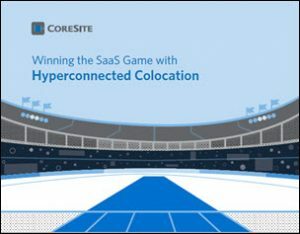 This new guide from CoreSite will highlight the challenges your SaaS organization faces in a competitive landscape. It will also illustrate how a data center partner that can provide hyperconnected colocation through direct access to cloud providers can help you maintain your strategic edge.